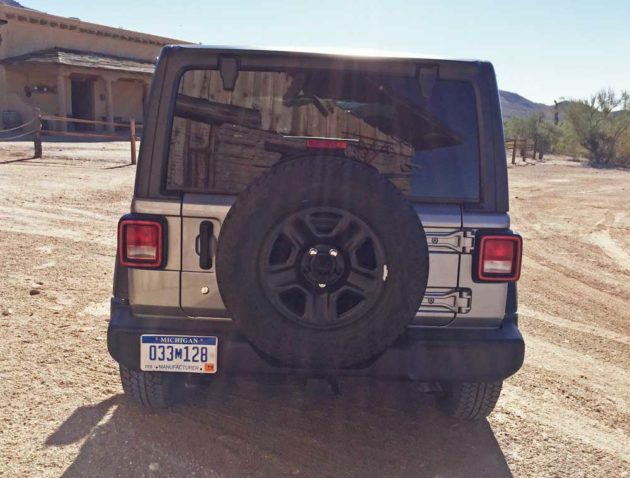 ?2018 Jeep Wrangler Sport 4-door Hardtop? The Jeep has been traversing adventuresome trails since 1941. The all-new 2018 Jeep Wrangler continues in that tradition by serving up increased legendary 4×4 prowess along with a more modern and sophisticated design that doesn?t forsake the brand?s original appeal and DNA. 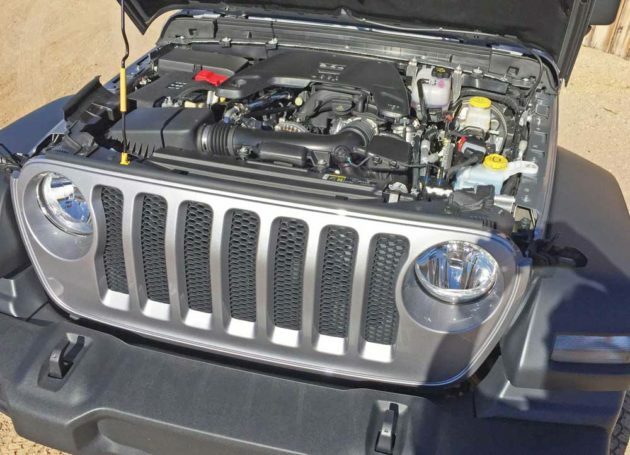 There will ultimately be three combinations of fuel- efficient powertrains: a 2.0-liter turbocharged inline four-cylinder engine with an all-new eTorque technology system that improves fuel economy and that mates to a new eight-speed automatic transmission; a 3.0-liter EcoDiesel engine will be available on Wrangler 4-door models, also mated to the new eight speed automatic transmission starting in 2019; and finally, as standard fare, a 3.6-liter Pentastar V-6 engine with a new six-speed manual gearbox and an available eight-speed automatic transmission. Engine Stop-Start (ESS) comes standard with 3.6-liter V-6 and 3.0-liter EcoDiesel V-6 automatic powertrains. There will also be three basic trim levels: Jeep Wrangler Sport, Jeep Wrangler Sahara, and the flagship Jeep Wrangler Rubicon. 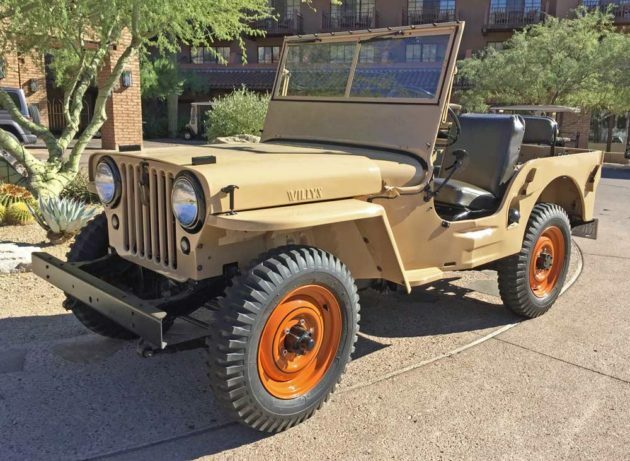 The first Willys Jeep was an open air affair with no top or doors. 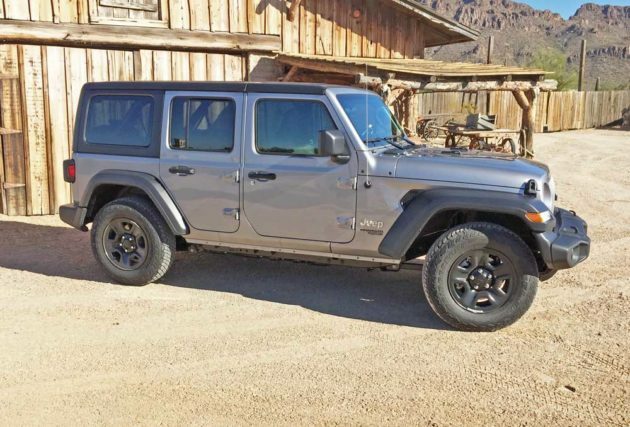 There are now both two-door and four-door Wranglers. Sport, Sport S and Rubicon are available as 2-door Jeeps, while Sport, Sport S, Sahara and Rubicon are available as four-door Wranglers. The Sahara models come only in a 4-door configuration. There are now four different tops available for a variety of open-air driving experiences, including for the first time, a power operated top. There are scores of different door, top and windshield arrangements, allowing for a variety of possibilities. Windshields still fold down, but now more easily with a new four-bolt system at the top of the windshield?s frame. Three variants of transfer cases will find their way into specific trim level Wranglers: the NV241 COMMAND-TRAC part-time system will see duty in both the Sport and Sahara models; another part-time system, the NV241 ROCK-TRAC will serve as the standard unit for Rubicon and diesel models; and finally, the MP3022 Selec-Trac, a full-time system will be standard for Rubicons with the manual gearbox an will be optionally available for Saharas and Rubicons with an automatic transmission. Axles will consist of an open Dana 30 or a Tru-Lok electronic locking Dana 44 Rubicon models up front, with Dana 35 and 44 rears for Rubicons in the rear – Open (Sport and Sahara) with available Trac-Lok anti-spin, Tru-Lok electronic locking (Rubicon). Ratios will be 3.45, 3.73 and 4.10 for both front and rear axles. Suspension componentry will consist of a solid axle forward with link coil, leading arms, track bar, coil springs and stabilizer bar ? an electronic sway-bar disconnect system is standard for Rubicons. Front shock types are gas charged twin tube shock absorbers with full displacement Multi-Tuned Valve technology on Sports and high-pressure gas charged monotube shock absorbers with MTV technology on Saharas and Rubicons, while Rubicons add a hydraulic rebound stop. There is also a solid axle in the rear with link coil, trailing arms, track bar, coil springs, and stabilizer bar. Shocks are the same setup in the rear as in the front. Steering is power assisted Electro-hydraulic. Brakes are power-assisted four-wheel discs (vented front) with ABS, All-speed Traction Control and Rough Road Detection, Brake-lock differential system, Brake- throttle override and Brake/park interlock. 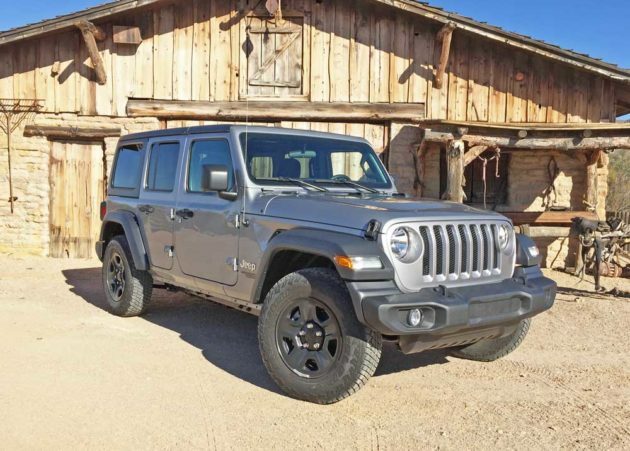 Axles are solid heavy duty Dana 44 units fore and aft and there are locking differentials as well as a disconnecting front sway bar (electronic on Rubicon models) that, with all combining to serve up the most capable Wrangler SUV to date. Wheel styles and sizes vary from model to model as do tires, and there are a host of accessories available for purpose and personalization. Crawl ratios are impressive and vary from model to model with the Rubicon ranking as the best. Approach, Breakover and Departure angles as well as Ground Clearances also vary from model to model, again with the Rubicon being the shining star. Figures vary between 2 and 4-door models. 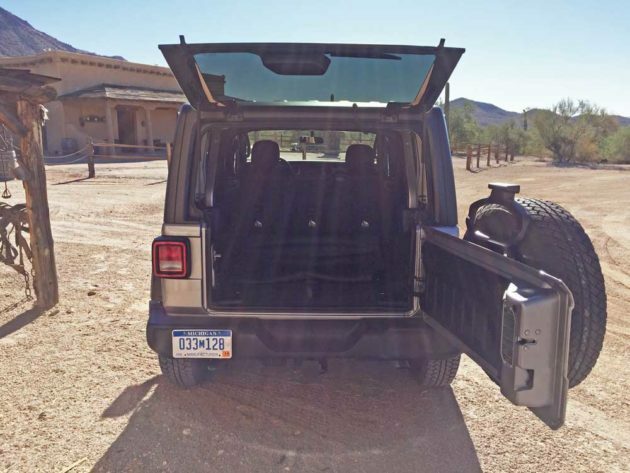 Water Fording capability is up to 30 inches and the towing capacity for Wranglers is 3,500 pounds. See Spec Box for actual measurements for 4-Door Sport. 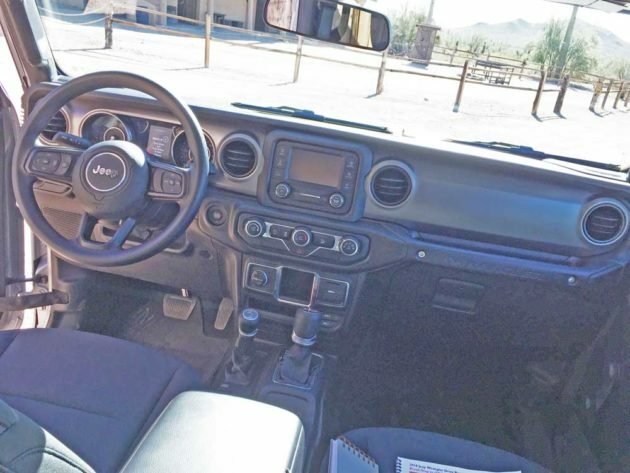 Technology features abound in the all-new 2018 Jeep Wrangler lineup, including: 4th Generation UConnect, which provides a range of available handsfree communication, entertainment and navigation features; a 7-inch TFT customizable screen with full-color graphics and more than 100 personalization options (there are actually four systems with 5.0, 7.0 and 8.4-inch screen sizes. ); Apple CarPlay and Android Auto. 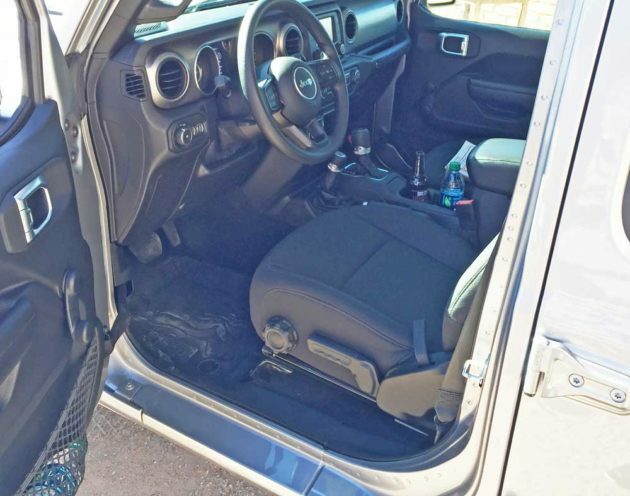 Safety features offered by the Wrangler number more than 75 including security measures as well. There?s Blind Spot Monitoring and Rear Cross Path detection; Parkview rear backup camera with dynamic grid lines as standard; Roadside Assistance and SOS call with overhead console-mounted buttons for emergency services, and All speed traction Control. 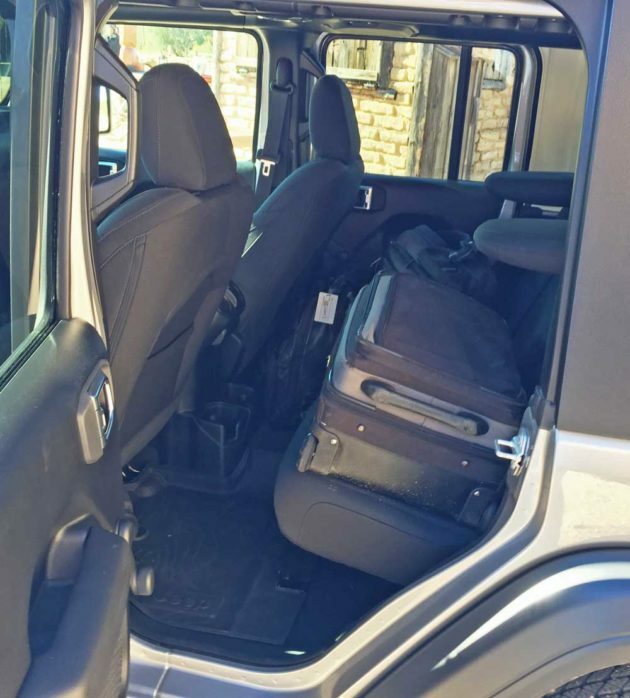 My on-road driving was done in a Jeep Wrangler Sport 4-door model powered by the 3.6-liter Pentastar V6 coupled to the 8-speed automatic overdrive transmission. The base price was set at $30,495., while the as tested price with the Automatic gearbox and Destination and Handling Charge amounted to $32,690. Option pricing was not available at the time of this writing, but options included: Trailer Tow and Heavy Duty Electrical Group; All-Weather Slushmats; Trac-Lok Anti-spin Differential Rear Axle; Deep Tint sunscreen windows; Freedom Top Black 3-piece hardtop; satellite radio and All Terrain Tires. 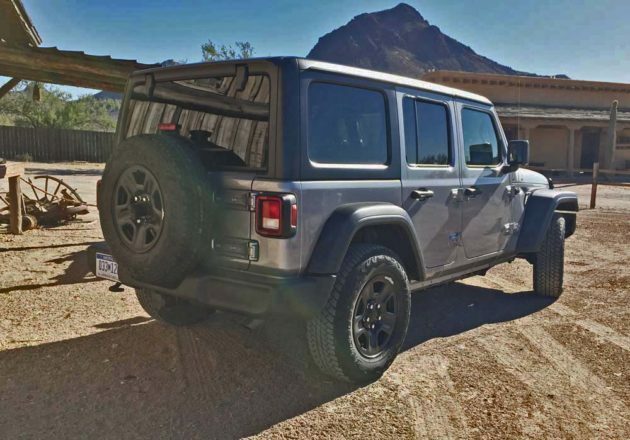 Off-road driving and rock crawling was done first in a 4-door Rubicon with the 2.0-liter turbocharged four banger with the 8-speed automatic with the Sky One-touch Power Top, and next in a Rubicon Wrangler sans top and doors. Both were base priced at $40,495., with the as tested price coming to $42,690 with the A/T and D&H, but again, without options. 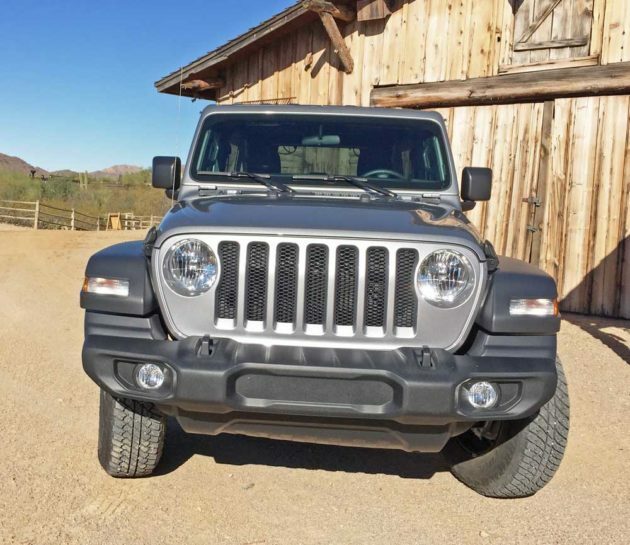 The entire stable of the latest Jeep Wrangler is not only better looking, with an updated styling treatment that doesn’t abandon traditional heritage cues, and all models are vastly improved in terms of performance both on and off-road. No more dodging and darting on washboard surfaces, and there?s increased stability over challenging, twisty back roads. Acceleration is quick and responsive and handling characteristics overall are much more satisfying with both the 2.0-liter turbocharged 4-cylinder and 3.6-liter V6. Seats are comfortable, but firm. As for severe rock crawling, the new Wranglers are probably the closest you can get to approximating the ability of a Mountain Goat, and easier removal of the doors and top along with folding the windshield flat makes for an entirely different perspective with enhanced terrain visibility. It also allows for a quick emergency exit should you happen to lose faith in your off-road piloting prowess. On the other hand, professional spotters help to alleviate one?s apprehension in ?hairy? scenarios with their expert guidance. Whenever asked what the best vehicle is for serious and abusive off-roading, my answer is always the Jeep Wrangler. After all, you wouldn’t want to scratch your Range Rover would you? The Rubicon is the obvious best choice, but the other models are capable as well for wilderness adventuring. All that?s left to do is choose the model that best suits you, decide on the number of doors and propulsion, and select a color and wheel style. Oh, there?s also a myriad of accessories to dress up your Wrangler, while enhancing the functionality and versatility. Bottom line, the Jeep Wrangler just keeps getting better and better. Price as Tested: $32,690. Includes A/T and D&H but not all options. Engine Type and Size: 3.6-liter Pentastar, DOHC, 24-valve V6 with sequential, multiport, electronic, returnless fuel injection. Transmission: 850RE Eight-speed overdrive automatic. Drive Train: Longitudinally mounted front engine / 4-Wheel Drive with NV241 Command Trac Part-time Transfer Case with 2W High,4WD High, Neutral, 4WD Low. Suspension: Front – Solid axle, link coil, leading arms, track bar, coil springs and stabilizer bar with optional sway-bar disconnect system and Gas charged twin tube shock absorbers with full displacement Multi-Tuned Valve technology. Rear ? Solid axle, link coil, leading arms, track bar, coil springs and stabilizer bar with Gas charged twin tube shock absorbers with full displacement Multi-Tuned Valve technology. Brakes: Power-assisted four-wheel discs (vented front) with ABS, All-speed Traction Control and Rough Road Detection, Brake-lock differential system, Brake-throttle override and Brake/park interlock. 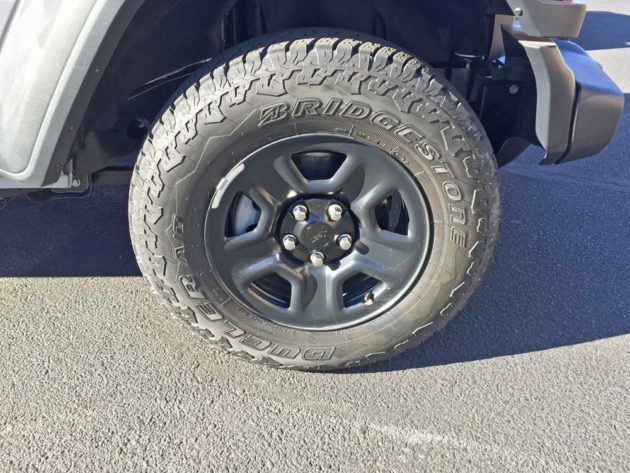 Tires: Bridgestone Dueler A/T RHS P245/75 R17 -112T M&S mounted on 5-spoke/hole Black Steel Wheels.